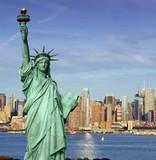 Guests of this tour can book their flights into any of the three major New York City area airports. Those flying into EWR can either take the shuttle to the hotel to rest or go shopping at the Jersey Gardens Mall. Those flying into LGA or JFK before 3:00pm will have the option to tour Flushing, Queens. Everyone who arrives before 5:00pm will have the option of joining a Night Tour of the city. New York, NY The Big Apple, The City That Never Sleeps, The Cultural Capital of the World… whatever you call New York City, its impact on worldwide culture and business is undeniable. Seeing this famous metropolis is something no one ever forgets!